Sorting through my holiday recipes, I stumbled on an old favorite for a rich caramelized onion pudding that goes well with turkey, chicken, pork or beef. 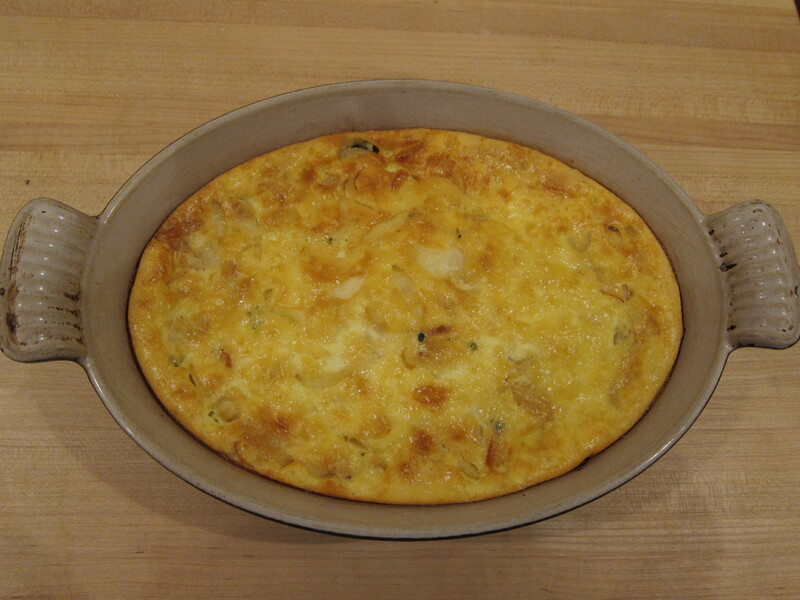 This is a versatile side dish for cold-weather gatherings that is simple to prepare. Be certain to slowly caramelize the onions until they are golden brown and sweet. TIP: It will take you about 15 minutes to properly caramelize the onions. 1. In a large skillet, heat the oil and butter. When melted, add the onions and the thyme. Cook slowly, over medium-low heat, until the onions turn limp and brown. 3. Using a mixer, beat the eggs. Add the dry ingredients and mix well over medium speed. 4. Lower the mixer speed and add the cream. 5. Grease a medium-sized gratin dish. Add the onions. Cover with the pudding mixture. 6. Bake 40 minutes or until browned and bubbly. Looks really good – will you make it for me sometime? This sounds deliciously rich and perfect for the holidays. Thanks, Lynda and best wishes to you and your family for a Happy Christmas! I am finally there – whew! So yummy sounding and yet so simple. I love caramelized onions- why have I never heard or thought of doing this before??? Simple and delicious – can be doubled for a crowd – thanks! !